The Annapurna 7 Passes trek is a 20 days long fairly challenging circuit that takes you through thick jungles, past fast flowing icy streams, across high passes that offers some of the best 360* views of the surrounding Himalaya including some of the 8000m+, and through villages that seem lost somewhere in time. The remote villages of Naar and Phu, once forbidden to outsiders today are ready to welcome trekkers. 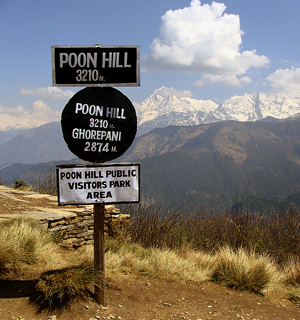 And as this is a fairly new route you will hardly meet any trekkers along the way. Note: The itinerary given below does not include days of arrival to and departure from Kathmandu. Trekkers need to carry their own food and camping supplies for a minimum of 4 days. Permits: ACAP and Special Permits for Naar and Phu food and camping supplies for a minimum of 4 days. Leave Kathmandu by 7AM in the morning (early breakfast) for the 12 hour drive to Taal in Manang district, north central Nepal. We arrive in Besisahar roughly around noon for lunch. From here we take a local vehicle to go to Taal on a bumpy gravel road along the Marshyangdi river bank. After having our permits checked in Khudigoan, and criss crossing across the river we arrive at Chyamje. There is a beautiful waterfall across the river here and serves as an ideal tea stop. The road to Taal is an experience in itself and offers scenic views of the green hills and terraces that are a permanent feature of the hill life. Taal is a beautiful village situated at the eastern bank of the Marshyangdi River. The village has around 300 inhabitants, mostly of the Gurung community. As the village has long been a part of the Annapurna Circuit there are plenty of comfortable lodges with modest basic facilities to spend the night after the long drive from Kathmandu. Out first day of the trek begins from the sleepy village of Taal along the river bank. About an hour from Taal we come to the village of Khotro (2200m) from where the trail turns east and a steep 2.5 hour long climb up the hill brings us to Naache, a small Gurung village with a few home stays. Although the village does not have restaurants offering western cuisine the local potatoes can be a hearty treat for a hungry trekker. From Naache the trail starts descending for about 30 min before reaching a very newly established 130 m long suspension bridge across a 200m deep gorge. In fact this bridge is the highlight of the day with views of the villages of Bagarchaap, Dharapani and Timang far off the western banks of the Marshyangdi below the Annapurna massif can be clearly seen from here. The trail continues along the pine forest from here. There is a very old small Bon/Buddhist monastery here for those interested in pre-Buddhist faiths of the region. A little further on the trail meets a gravel road until we come to a small suspension bridge across the Dudhkholariver to arrive to the village of Tilche, where one can meet trekkers arriving from the Manaslu trekking circuit. Immediately after leaving the village of Tilche the trail can be a little confusing as one has to walk through corn and potato fields. Further on there are some narrow bushy sections on steep slopes. Less than an hour after leaving the village, there is a small cave, a few minutes below the trail. The cave has stalactites and used to host meditating in the past. After the short detour we continue walking through the pine forest and corn fields to arrive at a suspension bridge. A short walk of 10 minutes brings us to a resting spot. We continue walking through the forest for another 1 hr to arrive at Tachai, a small Gurung village rested at a top of hill. The village has around 28 homestays where we will enjoy Gurung hospitality. The village also has a hot spring water flowing 20 minutes’ walk from the village. Leaving the serene little village of Tachai the trail immediately starts climbing up the slopes of the hills on the east where local goat and cattle herders take their animals to graze. A two and half hour walk brings us to ridge of Chong Danda from where we can see the village of Ghalinchowk in the far south. It is also not uncommon to see Langoor monkeys jumping from branch to branch, magnificent mountain goats posing from behind the bush, while gangs of Yellow Billed Coughs chase Flying Squirrels from tree to tree. The trail then starts heading down to the Chong river before heading higher up the valley where the tall pine trees give way to smaller birch trees and white, blue and purple rhododendron bushes. After having lunch on the banks of the river we head towards the ShongleKharka, our camping spot for the night, located in the valley between two large rocky ranges. This is also the grazing ground for yaks and we come across lonely herders who welcome you with a curiosity and a big smile. The yak herders can be a great source of information on the condition of the trail further up. Starting from Shongle- the trail disappears into the rugged mountain in the north east. As we clamber up the rocks towards the first of our passes, you can see the Annapurna (?) range in the distant west while the valley below comes to life with the bells of the yaks and the barking of their shepherd dogs. About 45 minutes on we come to a small shepherd hut. We continue our climb towards KuchumroPhedi at an altitude of 4525 m where we spend our camp for the big climb next day. We have now entered into the domain of the yak herders and Yarchagumba (CordycepsSinesis) harvesters. In late spring people from near and afar come to the grassy slopes above 3000 m all over the Himalayan range spending a few weeks camping there collecting the precious caterpillar fungus (CordycepsSinesis) or Yarsagumba. We gear up for a long uphill until we cross the Yarcha Pass. The day starts with views of Mt. Manasalu towards the east and Lamjung and Annapurna towards the west. A walk of about 2.5 kilometers brings us to the top to be rewarded with amazing views of Manaslu and Lamjung range as we make a pass of Kuchumro. The snowy pass requires proper equipment like gaiters, crampons. Once we pass the Kuchumro pass (54900 m), we walk down about 30 minutes to start uphill to cross the Yarcha pass (4860 m). As we cross Yarcha pass, we are rewarded by the views of KangaruHimal (6941 m) and Annapurna II. We continue walking downhill to arrive at Namakyu (4595 m) where we spend our overnight after a long walk. We will camp by the river side directly facing the LamjungHimal and view of KangaruHimal. 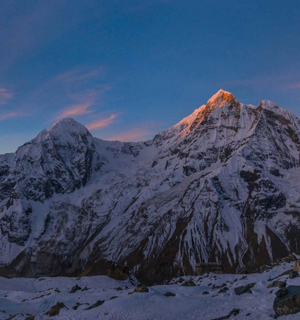 Wake up early for the early morning views of LamjungHimal, Annapurna II and Gangapurna towards the south west and KangaruHimal facing top towards the north. The clear sky with the views of mountains makes it a perfect ambience to start your day. After breakfast, we walk for about 10 minutes uphill and then descend for another 15 minutes to cross a small glacial river. We cross the river for gradual uphill facing Annapurna II and keeping KangaruHimal at the back. As we ascend for 2 hrs. we are greeted by the views of Pisang peak standing majestically above the Pisang monastery from where we take a gradual walk facing Pisang to arrive at the Meta pass (4800 m). Pack lunch is recommended today as there is shortage of water before the pass. After lunch at the pass, we start to descend towards Meta. It takes about 4 hours to reach Meta from the pass. We arrive a river with a small bridge from where we start to ascend for another 1 hr to reach Meta – a small village with few houses. Today is a moderate but long walk. We get the early morning sunrise view of Lamjung Himal on the south and Pisang peak towards the west. After breakfast we start with a gradual easy walk with view of Pisang monastery on the other side of the hill. As we walk higher north we enter into the trans-Himalayan region which is much drier. About an hours walk from Meta we come across the first of the former settlement of the Khampa people in a place called Jhunum which is now used as a winter home by residents of Naar village. The Khampa’s are people from Eastern (?) Tibet who were waging a guerrilla war against the Chinese in the 1960s using Nepali territory in Manang and Mustang as their base. The trails continue across a glacial river and to arrive at another Khampa settlement at Chyakhu. The ruins of the former settlement of the Khampa is testimony to their ability to adapt to life in the high Himalaya as can be seen by the canals they had built to irrigate their fields. (Recommend reading: Buddha’s warrior for more info on Khampa war). We walk further with gradual uphill and then descend to arrive at a small bridge to cross the river from where we start ascending for about 20 minutes to arrive at Kyang, another Khampa settlement, located safely between two large rocky outcrops. After lunch the trail starts being carved out of the cliff and we continue on this trail with Phu River on the left side for another 3 hrs to meet a wooden bridge. Cross the bridge and continue walking. During the monsoon, if the river is high we continue walking on the same side instead of crossing the bridge. As we approach the final ascent for Phu, we arrive at big canyon from where a straight uphill of 15 minutes brings us to the old gate. As you walk along the river on the left are remains of an old fort that would have served as a lookout point in the days past. A little further ahead is a long mani wall while glimpse of Phu in the distant cliffs come into view. A little ahead is a suspension bridge leading across the river and into Phu village. Phu is a village that takes you back somewhere in time. From a distance it looks as though the village has been carved out from the hills behind it with the stone buildings almost being camouflaged by cliff. The houses are built with rock and timber with mud plasters though there are now a few modern houses. The TashiLakhang monastery about 30 minutes for the village in Phu, is one of the oldest in the region and was famous for the edict by the late Rimpoche or head monk who on request by the villagers only accepted to stay back if they promised that the village would ban alcohol and tobacco. To this day sale and consumption of tobacco is forbidden in the village although the cold couldn’t keep the alcohol away. 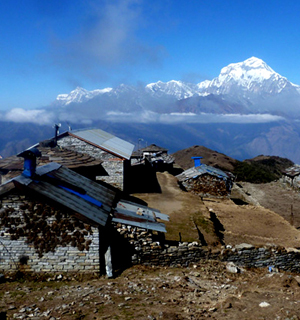 As we leave Phu village and start climbing we are served with the views of Himlung Himal and KangaruHimal. the trail climbs up towards Phu Pass (5200m) for 3 hours from where we can get splendid views of Mt. Himlung with the glacier in the north east as well as Mt. Khangru in the south . From the top of the pass the trail descends down to the river for about 3 hours until we reach a bridge from where we start walking for approximately an hour to reach the yak herders camping area known as Loang. Wake up in the morning to the views of Himlung and Kangaru peaks. The trek starts with an ascent of the Naar pass. The view of Himlung and KangaruHimal stays with us until we reach the top of Nar pass (5400 m) which takes about 3 hours. As we approach the pass, the scree fields make it rather challenging to reach the top. However, once we are there a 360* view of the mountains including Bhrikuti, Himlung, Kangaru towards the east and Chulu and Annapurna range towards the south west greets us. We then descend from here to lose about 1400 m through the scree field to arrive at Checkchu where we camp for the night. After breakfast, we start to descend for about 1 hour until we reach a suspension bridge. Another two hours of slow ascent along the river brings us to a small valley surrounded by tall cliffs with natural caves in it. A steep uphill here for another 3 hrs will bring us to the beautiful Naar village. We arrive at the Kang La Phedi (4530 m) after 3 hrs walk and camp here. The top of the Khangla Pass at 5413M probably offers some of the best 360* views of the entire trek early in the morning. On a clear day we can see the smaller peaks of the Chulu range in the northeast, Manaslu in the south east, Pisang peak in the south and the Annapurna range in the west. From the base of the pass we first cross a small glacial stream before starting our 3 hour ascent to the top, near which is a small glacial lake. 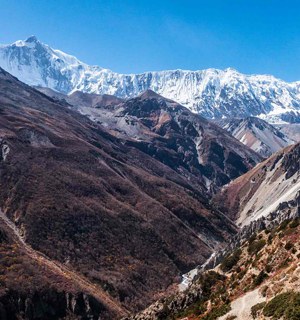 As we walk down from Khang La, first through a scree field, and then the grassy slopes where herders bring their animals to graze, the Marshyangdi Valley and the Annapurna range looms large in front of us. We can even make out the runway in the airport in the town of Humde down in the valley. The walk to Ngawal from the top of the pass takes about 3 hours. Our rest day at Ngawal today can be spent walking around the village of Ngawal and meeting local people and interacting with them. This small village has a population of roughly 300 people and offers splendid views of the Annapurna range looming above the Marshyangdi river valley in the west. We continue our trek towards the base of the pass that is Thorong La and climb steadily through Tenki and leaving the Marshyangdi Valley behind. As we continue along the JarsangKhola Valley we arrive at the small settlement of Ledar at an elevation of 4250M. From Ledar to the trail to ThorongPhedi is a gradual ascent past towering cliffs and rockfalls. On the way, we go through the outstanding views of Mt. Ghundang, Mt. Syagang. Although the day is not that long, it is better to reach ThorangPhedi early and rest as the walk next day can be long and exhausting with many trekkers heading up the Thorang Pass as early as 3AM in the morning to make the most of day. The trail becomes steep as soon as we leave ThorongPhedi. Following rocky ridges, as it ascends to the Thorong La pass (5416M), the Great Barrier Ridge appears. From the top of the pass we can get the first glimpses of the other side of the Annapurna which gives an idea of what Tibet must look like. The walk down from the pass is long and exhausting although it is just walking downhill. Muktinath (literally Lord of Emancipation) is considered holy by Hindu’s and Buddhists and draws pilgrims from all over. The temple complex has 108 stone water spouts from where the pure waters of the mountains flow out. Hindu’s believe that a shower through all the 108 water spouts washes your sins. The Buddhist shrine which is believed to be much older has a natural flame inside that is probably fueled by natural gas from inside the earth. Although this is the last day of the trek, and getting to Jomsom by vehicle is much faster, the walk down can be leisurely as there is no uphill to climb. The stretch from Muktinath to where the road meets the river near Kagbeni gives us a glimpse of the high altitude desert terrain that opens towards the Tibetan plateau further up north. The region is a dry arid landscape with the high snow covered peaks like Tilicho Peak and Nilgiri in the south and Dhaulagiri to the west. Walking down we cross the villages of Jharkot and Kagbeni, the gateway to the once forbidden kingdom of Lo Manthang. Kagbeni has a magnificent old monastery and some great lodges and restaurants and is worth the lunch stop. Jomsom, is about 3 hours walk away, along the banks of the Kali Gandaki river where strong gusts of the wind almost pushes you back. The town has an airport but due to the wind factor flights can only land in the first half of the day. We take an early morning flight from Jomsom to Pokhara and catch a connecting flight back to Kathmandu.